The value of existing UK coal plant ? Negative sentiment towards coal fired generation capacity in the UK is well illustrated by the fall in the value of Drax. Drax shares have almost halved in value since the peak of the financial crisis in 2008 against a backdrop of a broad based stock market recovery. Coal plant’s fall from favour has been driven to a large extent by a decline in the forward Clean Dark Spread, the margin between the price of power sold and the cost of coal and carbon required to generate it. 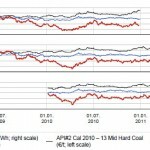 However the flexibility of coal plant to respond to market price volatility presents an interesting value opportunity. Negative sentiment towards coal fired generation capacity in the UK over the last few years is well illustrated by the fall in the share price of Drax, the operator of the UK’s largest coal plant. Completed in 1986, Drax is the most recently commissioned UK coal plant and one of the most efficient and reliable. Despite this Drax shares have almost halved in value since the peak of the financial crisis in 2008 against a backdrop of a broad based stock market recovery. Coal plant’s fall from favour has been driven to a large extent by a decline in the forward Clean Dark Spread (CDS), the margin between the price of power sold and the cost of coal and carbon required to generate it. The annual forward CDS has fallen from a range of £15 to £20/MWh in early 2009 to a trough below £5/MWh in 2010 as shown in Chart 1. In recent months forward spreads have staged a small recovery to around £10/MWh, as a rise in gas prices has fed through into higher power prices. However spreads are still depressed relative to levels required to support the cost of new coal plant (in excess of £20/MWh). The value of coal plant has also been impacted by the Large Combustion Plant Directive (LCPD) enacted to control the amounts of Sulphur Dioxide (SOx), Nitrous Oxides (NOx) and dust that power stations can emit. Under the LCPD, plants are either required to invest in costly technology to reduce emissions or may choose to ‘opt out’ by restricting their operation to a maximum of 20,000 run hours from 2008 to 2016. Around 11.5 GW of UK generation capacity has chosen to opt out of LCPD and is therefor required to close by 2016. Coal capacity is cheaper but does it represent a value opportunity ? The current level of forward dark spreads mean that coal fired generation capacity has relatively little value as measured against forward prices (intrinsic value). However coal capacity has a relatively high value associated with its flexibility to respond to changes in market prices (extrinsic value). The ability to access this extrinsic value without having to pay up for intrinsic value presents an interesting value opportunity. A coal plant can be characterised as a strip of Clean Dark Spread options whose exercise is influenced by the overlay of the physical characteristics of the plant. The strike price of these CDS options is determined predominantly by the efficiency of the plant. The extrinsic value of the options is greatest when the strike price is at the level of the forward dark spread (‘at the money’) as has been the case with less efficient coal plant for periods over the last two years. In simple terms, when the expected load factor of the plant is low there are likely to be more occasions on which the plant can capture value from changes in the CDS due to advantageous market price movements. Extrinsic value is much more difficult to quantify than intrinsic value, given its dependency on unobservable parameters such as the volatility and correlation of the underlying power, coal and carbon prices. Traditional plant valuation methods which focus on scenario analysis using forecast spot prices tend to significantly underestimate the extrinsic value from plant flexibility. Valuation is further complicated when there are annual constraints such as load factor restrictions due to emissions limits or a maximum number of starts, as these introduce a path dependency to the plant optionality.